(P2) Just like Hannibal in ancient times, Swiss engineers have conquered the Alps, the AP reports. European dignitaries on Wednesday inaugurated the 35.4-mile Gotthard Railway Tunnel, the world’s longest railway tunnel and a major engineering achievement deep under the Alps’ snow-capped peaks. It took 17 years to build at a cost of $12 billion, but workers kept to a key Swiss tradition and brought the massive project in on time and within budget. Many tunnels crisscross the Swiss Alps. The Gotthard Pass itself already has two. But the Gotthard base tunnel is a record-setter, eclipsing Japan’s 33.4-mile Seikan Tunnel as the world’s longest, and it also bores deeper than any other tunnel, running about 1.4 miles underground at its maximum depth. 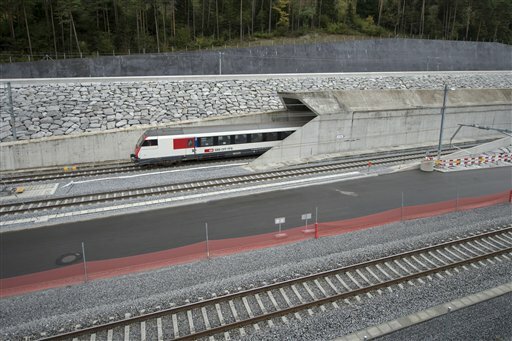 (P3) The Gotthard Railway Tunnel is part of a broader, multi-tunnel project to shift the haulage of goods from roads to rails amid concerns that heavy trucks are destroying Switzerland’s pristine Alpine landscape. The tunnel’s impact will be felt across Europe for decades. The thoroughfare aims to cut travel times, ease roadway traffic, and reduce the air pollution spewed from trucks traveling between Europe’s north and south. Set to open for commercial service in December, the two-way tunnel can handle up to 260 freight trains and 65 passenger trains per day. Switzerland pulled out all the stops for Wednesday’s inauguration. Chancellor Angela Merkel of Germany, President Francois Hollande of France, and Italian Prime Minister Matteo Renzi all came to southern Switzerland for an upbeat, glitzy celebration featuring musical bands, dancers, and even a theme song for the tunnel. Are there any mega transportation construction projects happening right now in your country? If so, describe one. If given the opportunity, would you take a ride on this train? Why or why not? Describe the public transportation systems used in your country. Who else besides the Swiss engineers have conquered the Alps? How long is the record-breaking tunnel?